Once you have completed the uniform evaluation, prepared the written summary of the findings of the committee and made your presentation to the governing body, the bids are opened. Now you have all the pieces to the puzzle and it is time to make a decision. Your decision must be to award the contract to the company offering the product that meets the standards you have established, at the most competitive price. This decision is totally in the hands of the school and the uniform companies must abide by the decision made by your school. After you have selected your vendor, you should notify all the bidding vendors of your decision. Samples sent for evaluation need to be returned to the manufacturers as soon as possible. The successful vendor will send are presentative to your school to measure your students and finalize the order. At this time you must give your approval of the sample uniform. The sample uniform will be returned to your selected vendor to be used as the prototype that is the ultimate authority if questions arise about your order. Most often this sample is the “exact” sample that was provided to you early in the process. If you have made styling changes since the sample was produced, the company can provide “dummy” parts (i.e. sleeves, coat fronts, etc.) that show the finished look. These parts should be attached to your sample showing your final design. If the changes were significant, the vendor may supply another sample for your approval. However, this takes up precious time and holds up production of your order, therefore, most schools work with the original sample and any “dummy” parts that are needed. Your Fruhauf representative will also measure your students at this time. The question that always comes up is “Who should we measure?” We recommend that you measure the current organization that will use the uniforms. If you have a 9th-grade through a 12th-grade group, we would recommend you measure the CURRENT 9th through 12th-grade students. If you measure the 8th through 11th-grade students (next years 9th through 12th-grade), you will have uniforms that fit students in 8th through 11th grade. 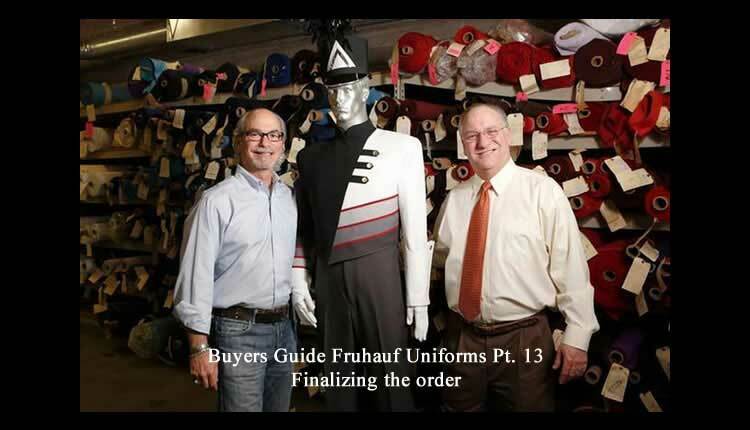 After your students are measured, your Fruhauf representative will show you the sizes taken so far and you and your Fruhauf representative can then decide on the sizes of the extra uniforms that you are ordering. This method is not written in stone and if you dohave that large 8th-grade student you would really like to measure, then we will measure them. We don’t want you to wind up with “a closet full of suits that are too small to use” any more than you do. After you have determined sizes, the financial aspects of the order must be worked out. As mentioned earlier, the order is complete only when accompanied by a purchase order or deposit check. To facilitate things, pleasehave this phase of the process figured out before measuring day. If you say “We’ll send that P.O. within a day or two!”, it is a sure bet that we won’t see a purchase order within a month, and you will be upset when you are told your delivery will be delayed since the order was not finalized on the day measurements were taken. Once the representative has accumulated the measurements, approved sample and purchase order and/or deposit check, you can relax and start cleaning out your closets in anticipation of delivery of your new uniforms.